Advokatskrivstovan is organized as a partnership. 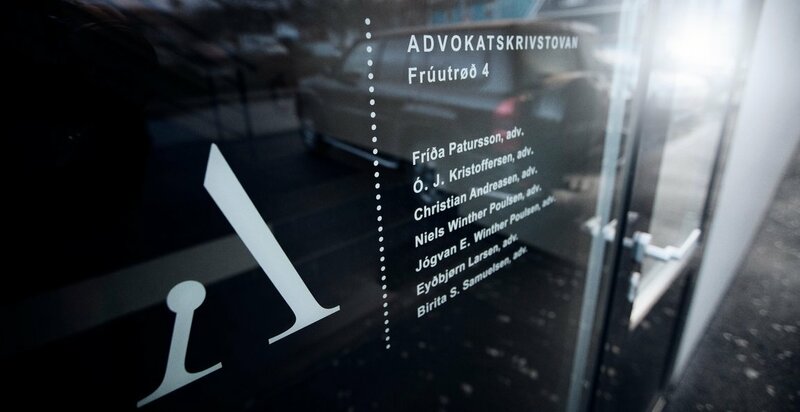 Advokatskrivstovan has client accounts in Eik Banki, BankNordik, Norðoya Sparikassi and Suðuroyar Sparikassi. If a bank goes bankrupt, the depositors are guaranteed according to the Act on ”garantiordning for indskydere og investorer” with a maximum amount of EUR 100,000, approximately DKK 745,000. The maximum amount covers the entire deposit at the bank, regardless of whether the funds are deposited in various accounts, hereunder a client account and own account. Regardless of a possible bankruptcy, a guarantee exists for up to EUR 10,000,000 for transactions with regard to real estate for private use. All lawyers, working at Advokatskrivstovan, are licensed by the Ministry of Justice in Denmark to work as lawyers and are members of the Danish law society, Advokatsamfundet (the Danish Bar and Law Society) and Advokatfelag Føroya (the Faroese Association of Lawyers). All lawyers working at Advokatskrivstovan are covered by liability insurance from the Danish insurance company, Codan Forsikring. The liability insurance covers all legal work at Advokatskrivstovan. Advokatskrivstovan does not use ordinary terms of engagement, hereunder regarding the choice of law and/or venue, unless this is specifically agreed with individual clients. The lawyers working at Advokatskrivstovan are under the supervision of Advokatsamfundet (the Danish Bar and Law Society), and are covered by the rules on good practice for lawyers according to § 126 in the Act on the Administration of Justice. The ethical rules for lawyers also cover our work. The ethical rules may be found at the web-page of Advokatsamfundet www.advokatsamfundet.dk. If a disagreement exists on the fee of a lawyer, the client may refer the size of the fee to Advokatnævnet, Kronprinsessegade 28, 1306 København K, www.advokatnaevnet.dk.